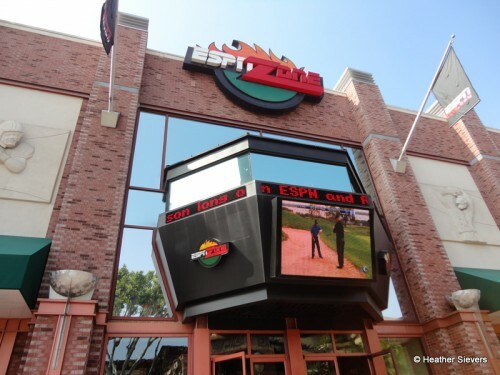 EDITOR’S UPDATE: Please note that ESPN Zone in the Downtown Disney District closed in June 2018 to make way for a new hotel coming to Disneyland Resort. 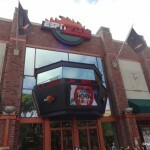 Looking for somewhere to eat lunch; a friend of mine and my two boys decided on ESPN Zone. It had been forever since I’d eaten there, so I figured it was time to give it another chance. 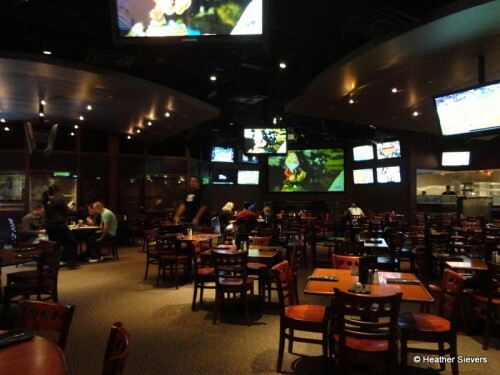 The restaurant is a sports-lover’s dream, with tons of sports memorabilia and enough flat screen TVs to watch every single sports event taking place at the time. 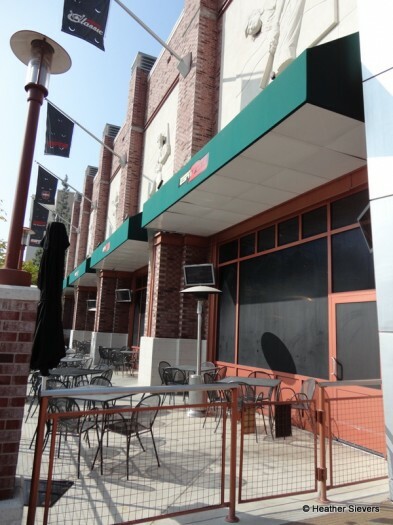 There are indoor and outdoor dining areas, so you’re welcome to eat on the patio if you’d like. 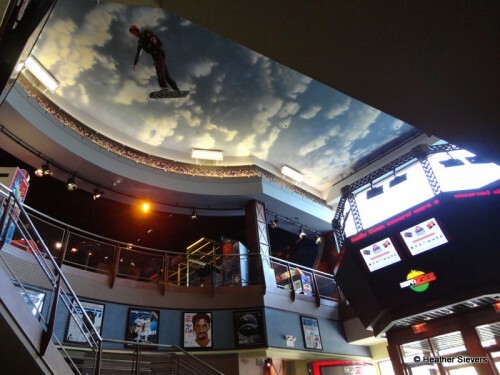 However, you’re then subject to the creepy face-moving sports players that adorn the outside of the ESPN Zone building. They’ve freaked me out since the day I laid eyes on them years and years ago (AJ’s weirded out by them, too). I’ve included a video of these guys at the end of the post, so feel free to check ’em out! After checking in, I made my way to the bathroom so I could share something pretty awesomely hilarious with you. TV while you pee. 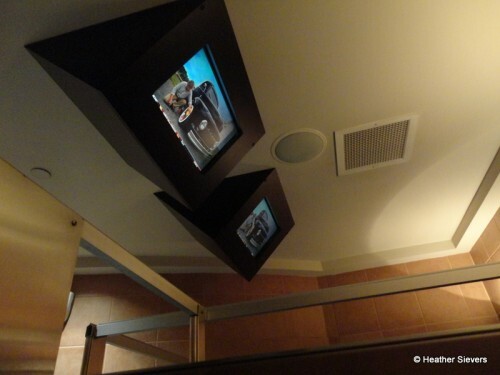 Yep, TV screens in the bathrooms. Each stall has its own television above it and in the men’s bathroom there are small flat screens in front of the urinals. I know this because my boys made about 15 trips to the bathroom while we were there. 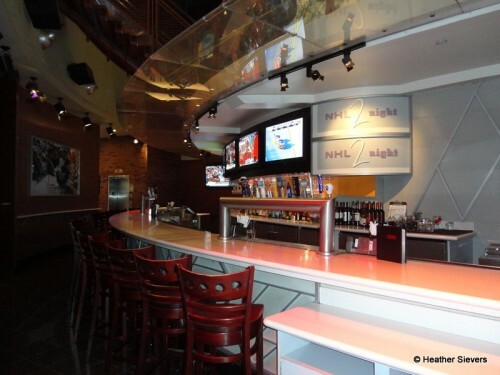 After my potty pic stop, I headed over to the bar to get a few shots (the camera kind, not the drink kind!). The bar here is pretty extensive; it’s only open when the restaurant is busy, and in the evening on weekends. You can still order drinks, but only from your table server. 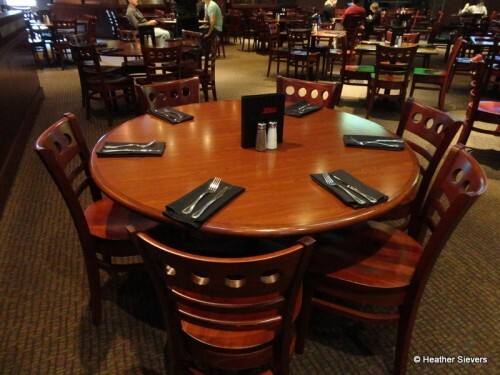 We were there on a Friday afternoon around 1:00 and it was totally dead, so we were seated quickly. 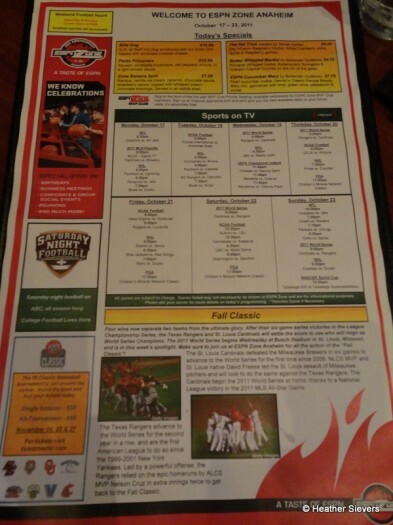 Once seated you’ll get a daily “sports page” that features restaurant specials and current sports news to read while you dine. 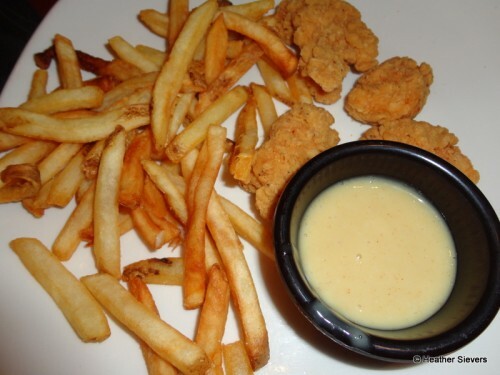 We peeked at our own menus and decided on what we were going to eat. 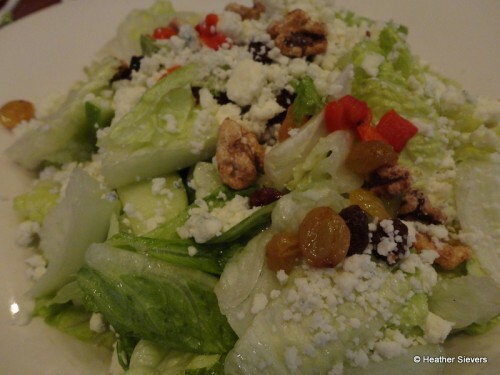 I went with the Blue Cheese Apple Walnut Salad: crumbled blue cheese, apples, raisins, candied walnuts, diced red peppers, and romaine lettuce tossed with white balsamic vinaigrette. 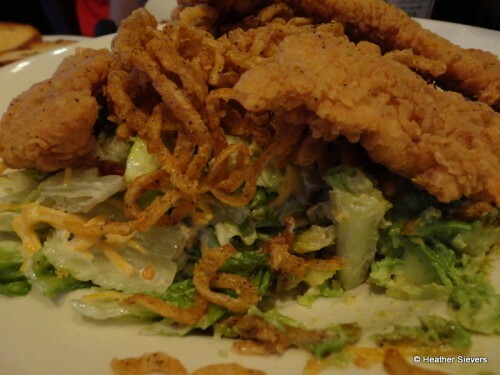 The salad was served fresh, the lettuce was crisp and cool, and the toppings were aplenty. Overall I was very pleased and enjoyed my lunch! 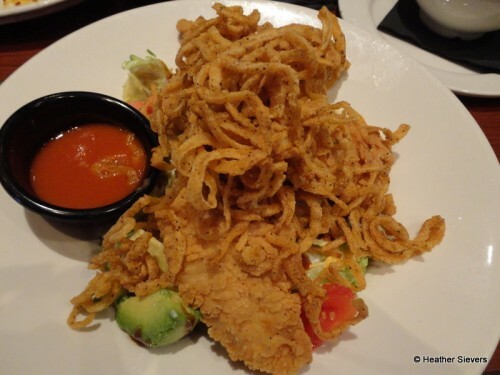 My friend ordered the Chicken Tender Salad with a side of garlic toast: chicken tenders with romaine lettuce, avocado, tomato, and cheddar cheese tossed in ranch dressing, drizzled with BBQ sauce, and topped with onion straws. The salad looked amazing and it was! Throughout the meal, there was a table next to us of three Cast Members who were chatting with us. They were on their lunch break from the construction site over at the Disneyland Hotel and they were wondering why I was taking so many photos (I get that a lot). When I told them what I was doing, they immediately forced me to try their Cheese Fries, which were topped with bacon, cheddar, mozzarella, and pepper jack and served with ranch dressing. And guess what? They were delicious. 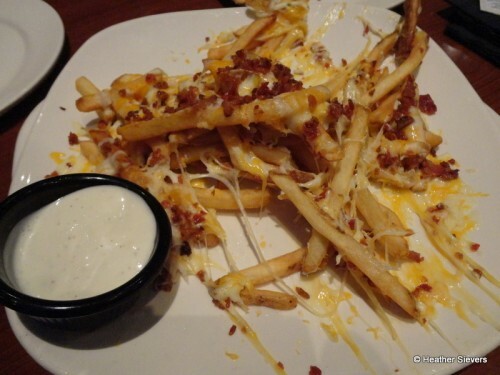 The fries were crisp, the cheese was melty and the bacon was crunchy. Perfection. 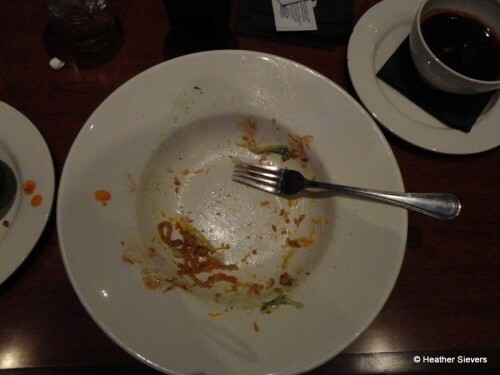 AND, when our neighbor finished up his meal, he asked if he could borrow my camera to take a photo! I congratulated him on being in the “Clean Plate Club” to which he replied, “Well, your readers need to know how delicious this was!” It was quite funny. Clean Plate Club after Chicken Tender Salad! 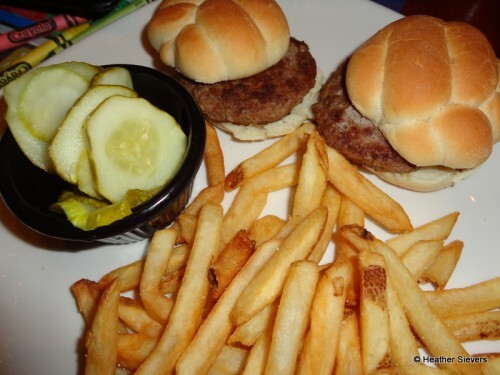 In addition to his clean plate photo, our friendly neighbor also took photos of his friends’ lunches. I did not taste these, but the guys did eat all of their lunches, so I’m going to assume that they were just fine. 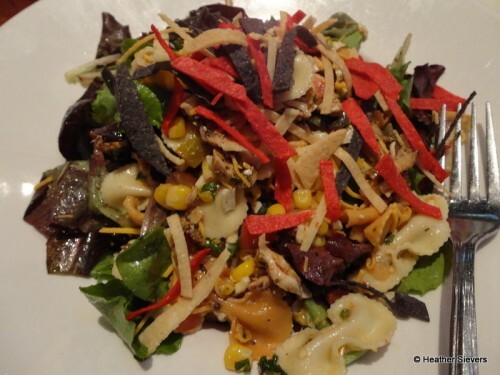 One of them had the Southwest Chicken Salad: spring lettuce mix with cheddar, mozzarella, and pepper jack cheese, bow tie pasta, and corn salsa tossed in a chipotle vinaigrette dressing topped with a Cajun chicken breast. 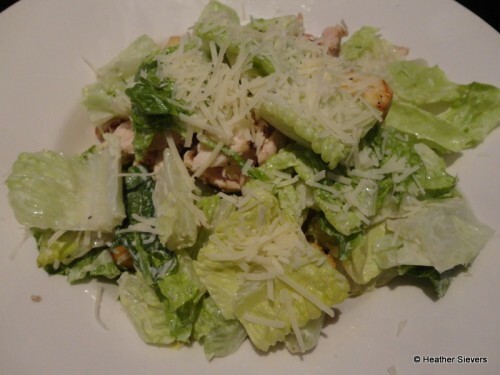 The other had a Traditional Caesar Salad with grilled chicken. 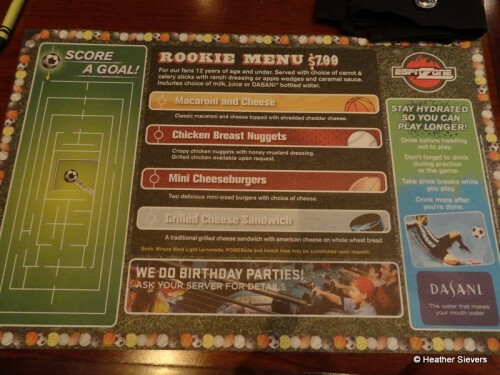 As far as the “Rookie Menu” goes, I love that fact that it is for Children 12 and Under. Most Disneyland Resort menus are 9 and under and there is a huge jump in price when you go from kid to adult menus; trust me, I have a 10 year old who knows that at Disneyland he is still “9” shhhhh. 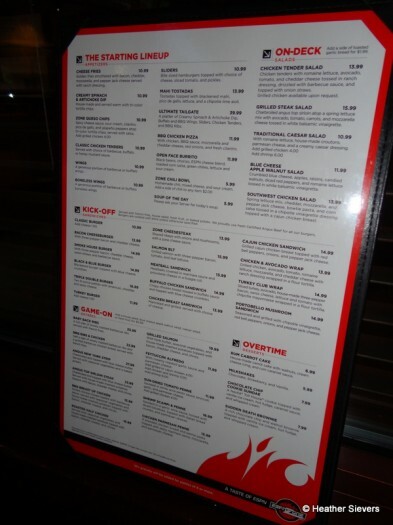 I also like this menu because it is simple. Four choices makes it easier for kids to choose. At our table we ended up with one order of Mini Cheeseburgers (minus the cheese) and one order of Chicken Breast Nuggets. And for $7.99 you get the entree, a side (carrot & celery sticks with ranch, apples & caramel sauce, or french fries — even though it is not listed as an option, which is nice of them in case parents don’t want to go the french fry route), and a drink (milk, juice, and bottled water are the menu options, but like with the fries, soda is also available if mom and dad are OK with that). Both of my boys had no complaints with their meals. 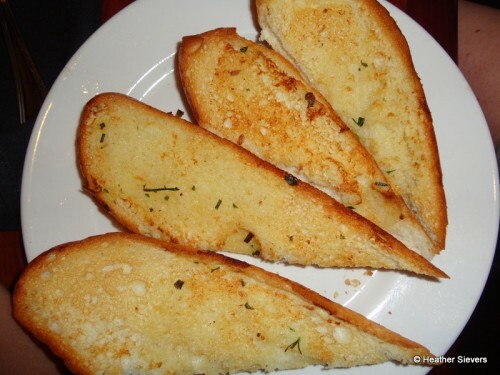 Everything was served fresh and warm, nothing soggy or overcooked. 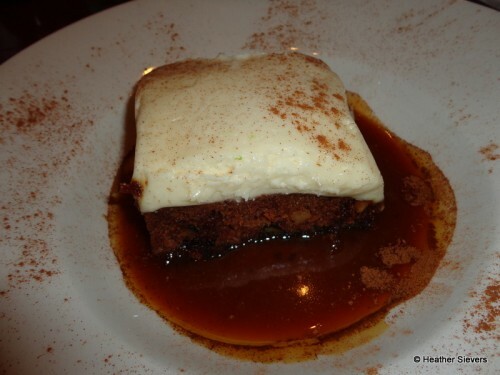 Because we were so pleasantly surprised with our food we decided that we’d give dessert a whirl too. 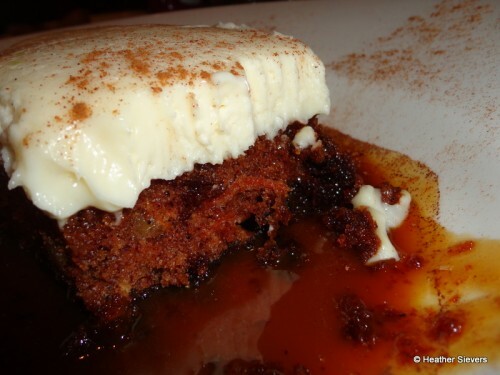 And I’m SO glad we did, because we discovered something amazing: The Rum Carrot Cake — house made carrot cake with walnuts, cream cheese icing, and rum caramel sauce. I am a huge fan of carrot cake, so when I saw the options on the dessert menu, I knew immediately that I wanted to try this out. The cake was moist, the frosting was a thick layer of sweet and creamy deliciousness & the caramel rum sauce was served warm underneath the cake. The rum was very mild, in fact I’d pretty much consider this “caramel” sauce. After lunch and dessert, I took my camera for a little field trip and I noticed this incredible feast being delivered to a table. So, of course I asked if I could snap a photo. I give you the Ultimate Tailgate: a platter of creamy spinach and artichoke dip, buffalo and BBQ wings, sliders, chicken tenders, and BBQ ribs. Overall, I have to say, I have a new opinion of the ESPN Zone. 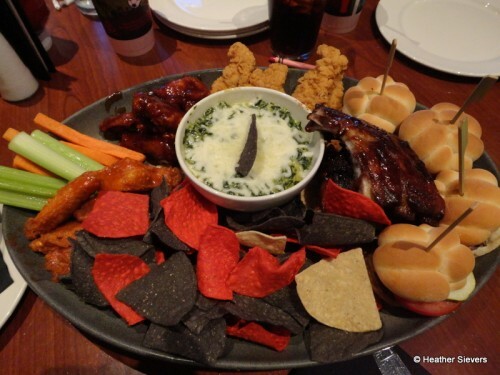 We had great food and great service, and with our Annual Passholder discount, the price was very fair for what we got. As long as I’m not being bullied into buying game cards for the arcade, I think my visits may be a little more frequent. Oh and for the grand finale, you’ll remember that I mentioned previously the creepy face-moving sports players on the outside of the building. And so you could see it for yourself, here are a few video clips. I feel a trip in the near furtuer (I dont know if I can wait till next year). that is creepy. Do they have the recliners like the ESPN Club in Disney World? Daniel — I know, right?? JoAnn — I think they do! @Daniel – You should see them at 1:00am when you’re walking alone to your car. Talk about freaky!!! 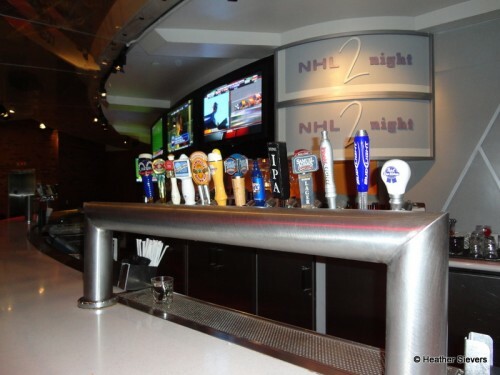 @Christal – You will love the cruise & I think a trip to Downtown Disney is in order to help with your withdrawals! @JoAnn – Yep, they do! We ate there when we took a trip out to Disneyland. We wanted something a step up from counter service for dinner, but nothing fancy. It was crazy busy, so the bar was open. Instead of waiting for a table we grabbed 2 seats at the bar and were ale to order from a full menu. We really enjoyed our meal, the company, and the drinks! I ate there on the Saturday before the Disneyland Half Marathon back in September. It was packed with college football fans (Go Gators!) and I was seated at the bar. I can’t even remember what I ate, but it was good. And I loved that I could get there so easily by taking the Monorail from Tomorrowland. 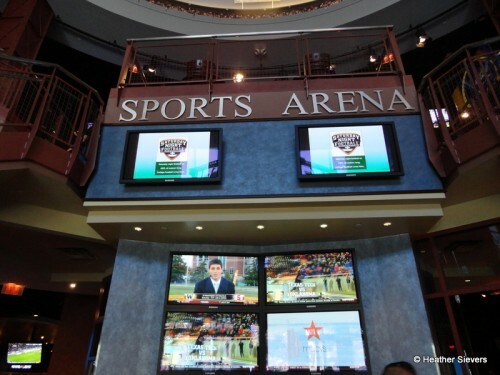 I love the ESPN Zone! DH swears their Buffalo Chicken Sandwich is “the best.” I’ve never had it, but he loves it. 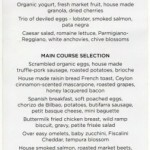 @Kelly – Smart thinking, & Good to know, I love when the bar serves a full menu. @Brandy – The frosting was amazing! @Elizabeth – The Monorail is a great way to get there fast from inside the park! Glad you had a good experience there. 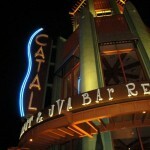 @Clair – I’ll have to try that next time!